In March, I’ll be talking at Spencer Breiner‘s workshop on Applied Category Theory at the National Institute of Standards and Technology. I’ll be giving a joint talk with John Foley about our work using operads to design networks. This work is part of the Complex Adaptive System Composition and Design Environment project being done by Metron Scientific Solutions and managed by John Paschkewitz at DARPA. • Complex adaptive systems design: Part 1, Part 2, Part 3, Part 4, Part 5, Part 6. But we’ve done a lot more, and my blog articles are having trouble keeping up! So I’d like to sketch out the big picture as it stands today. If I had to summarize, I’d say we’ve developed a formalism for step-by-step compositional design and tasking, using commitment networks. But this takes a while to explain. 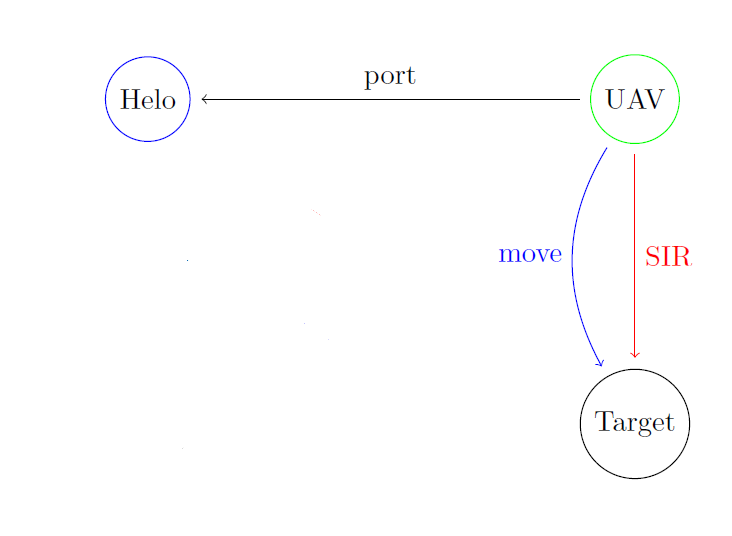 It has four nodes, which represent agents: a port, a helicopter, a UAV (an unmanned aerial vehicle, or drone) and a target. The edges between these notes describe relationships between these agents. Some of these relationships are ‘commitments’. For example, the edges labelled ‘SIR’ say that one agent should ‘search, intervene and rescue’ the other. Our framework for dealing with commitment networks has some special features. It uses operads, but this isn’t really saying much. An ‘operad’ is a bunch of ways of sticking things together. An ‘algebra’ of the operad gives a particular collection of these things, and says what we get when we stick them together. These concepts are extremely general, so there’s a huge diversity of operads, each with a huge diversity of algebras. To say one is using operads to solve a problem is a bit like saying one is using math. What matters more is the specific kind of operad one is using, and how one is using it. • John Baez, John Foley, Joseph Moeller and Blake Pollard, Network models. In this paper we mainly discuss communication networks. Subsequently we’ve been working on a special class of network operads that describe how to build commitment networks. Here networks X1, X2 and X3 are being wired together to form Y. This is a new methodology for designing systems. We’re all used to building systems by wiring together subsystems: anyone who has a home stereo system has done this. But overlaying systems lets us do more. For example, we can take two plans of action involving the same collection of agents, and overlay them to get a new plan. We’ve all done this, too: you tell a bunch of people to do things… and then tell the same people, or an overlapping set of people, to do some other things. But lots of problems can arise if you aren’t careful. A mathematically principled approach can avoid some of these problems. • The nodes of our networks represent agents of various types. The edges represent various relationships between agents. For example, they can represent communication channels. But more interestingly, they can represent commitments. For example, we can have an edge from A to B saying that agent A has to go rescue agent B. We call this kind of network a commitment network. • By overlaying commitment networks, we can not only build systems out of smaller pieces but also build complicated plans by overlaying smaller pieces of plans. Since ‘tasking’ means telling a system what to do, we call this compositional tasking. • If one isn’t careful, overlaying commitment networks can produce conflicts. Suppose we have a network with an edge saying that agent A has to rescue agent B. On top of this we overlay a network with an edge saying that A has to rescue agent C. If A can’t do both of these tasks at once, what should A do? There are various choices. We need to build a specific choice into the framework, so we can freely overlay commitment networks and get a well-defined result that doesn’t overburden the agents involved. We call this automatic deconflicting. • Our approach to automatic deconflicting uses an idea developed by the famous category theorist Bill Lawvere: graphic monoids. I’ll explain these later, along with some of their side-benefits. 2) in a step-by-step way, starting at a low level of detail and then increasing the amount of detail. To do this we need not just operads but their algebras. • Remember, a network operad is a bunch of ways to stick together networks of some kind, e.g. by overlaying them. An algebra of this operad specifies a particular collection of networks of this kind, and says what we actually get when we stick them together. 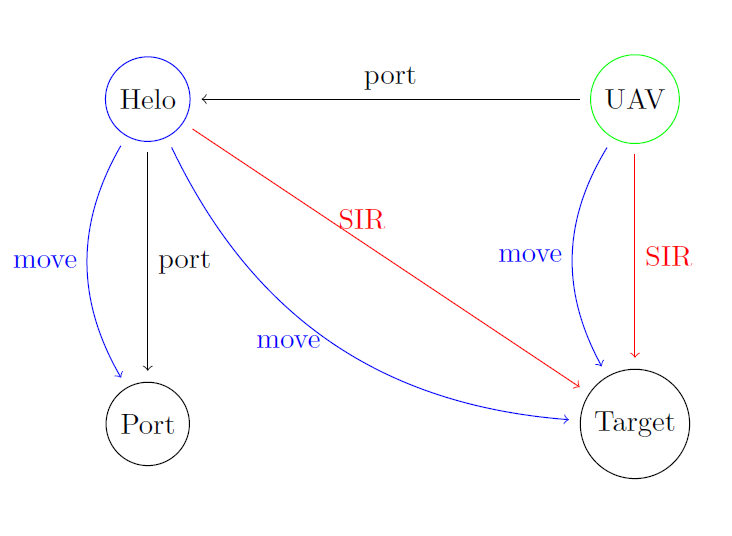 So, a network operad can have one algebra in which things are described in a bare-bones, simplified way, and another algebra in which things are described in more detail. Indeed it will typically have many algebras, corresponding to many levels of detail, but for simplicity let’s just think about two. which ‘forgets the extra details’. This sort of map is called a homomorphism of algebras. 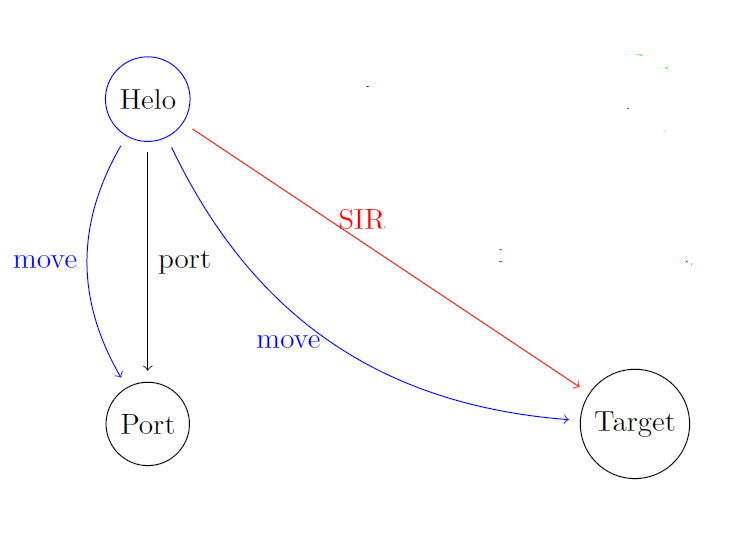 We give examples in our paper Network models. going back the other way. This lets us automate the process of filling in the details. But we can’t usually count on being able to do this. So, often we may have to start with an element of and search for an element of that is mapped to it by And typically we want this element to be optimal, or at least ‘good enough’, according to some chosen criteria. Expressing this idea formally helps us figure out how to automate the search. John Foley, in particular, has been working on this. That’s an overview of our ideas. Next, for the mathematically inclined, I want to give a few more details on one of the new elements not mentioned in our Network models paper: ‘graphic monoids’. In our application, this product is overlaying two networks. To understand this identity, let us think of the elements of the monoid as “commitments”. The product means “first committing to do then committing to do ”. The graphic identity says that if we first commit to do , then , and then again, it’s the same as first committing to do and then Committing to do again doesn’t change anything! But for a noncommutative monoid, the graphic identity is stronger than . It says that after committing to no matter what intervening commitments one might have made, committing to again has no further effect. In other words: the intervening commitments did not undo the original commitment, so making the original commitment a second time has no effect! This captures the idea of how promises should behave. As I said, for any network model, the set of all networks involving a fixed set of agents is a monoid. 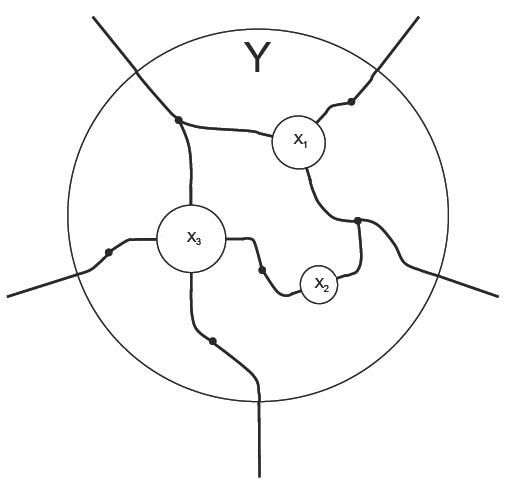 In a commitment network model, this monoid is required to be a graphic monoid. Joseph Moeller is writing a paper that shows how to construct a large class of commitment network models. We will follow this with a paper illustrating how to use these in compositional tasking. In the context of commitment networks, means that starting from we can reach by making some further commitment : that is, for some . So, as we ‘task’ a collection of agents by giving them more and more commitments, we move up in this partial order. This entry was posted on Monday, February 19th, 2018 at 1:09 am and is filed under mathematics, networks, software. You can follow any responses to this entry through the RSS 2.0 feed. You can leave a response, or trackback from your own site. Studying all your catster stuff (and participating in a category theory study group). You’ve a “formula does not parse” error just after “that is mapped to it by”.